Mission Statement, as stated by Bob Halligan, song writer, lead vocalist: "The most important thing about Ceili Rain is that our music celebrates life. This music strikes a deep chord in people, because it derives from a collective yearning people have for God, for spirituality, for home, for togetherness. These songs are written to be inclusive and inviting-anyone who wants some joy out of life is apt to like them. We are not here to serve a particular group of people. The joy, laughter and sense of fellowship that's felt at our shows is geared to everyone-all are welcome in this place." 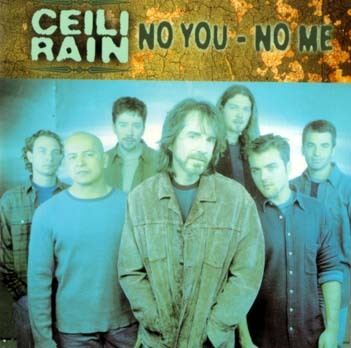 NO YOU - NO ME is Ceili Rain's fourth CD, a wonderful spiritual testimony which is yet another inspired addition to their spirit-inspired body of musical compositions created over the years. 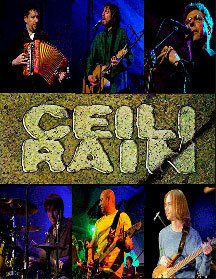 Over the past six years, Ceili Rain has become "one of the most critically acclaimed bands to emerge out of Nashville." Through his songs, Bob Halligan "speaks to the listener's heart, mind, and soul," says Phil Smith, music director at WJTL Lancaster, PA. "He is a wordsmith and tells parables of faith rarely found in today's songwriters." This reviewer couldn't agree more with the above statement; Halligan truly speaks to the listener's heart, mind, and soul, as he sings about the Christian spiritual truths that he finds at work in his own life, his dependence on his relationship with the Lord. The lyrics are supported by spiritual values that are important to Halligan and people of faith, and can be inspiring to those who are seeking faith. On NO YOU -NO ME CD, you will find uplifting, snappy, and poignant songs testifying to the power and love of the Lord, His goodness, faithfulness, and the need we have to depend on him to give us the power through the Holy Spirit to love one another as Jesus loved us, spreading the Lord's love to those who need it, who in turn may find joy and peace in the Lord. "A HUNDRED SMILES AN HOUR" - A favorite of this reviewer - Celtic dance style music that starts off with a snappy straight Celtic march drum snare, with the Celtic instruments joining in with syncopated dance Irish tune. The snare turns into a hard rock beat after 5 stanzas, but temporarily disappears during the chorus. When the vocals come in, the musical tune complements the melody which is carried by of the vocals. Lyrical Sample: I ran from my house, all the way to your house, But I swear I don't care, sunshine or rain, nothing can make me slow down on the way. Nothing can stop this hold you have on me. Chorus: You've got me doin', a hundred smiles an hour, a thousand times a day, there's a million bolts of your power, pulsing through my veins. May it always be like this, all the rest of my days. Hay! The message of this song reminds me of Ephesians 4:29;32 and Hebrews 10:24-25. Lyrical Sample: 1)Well that's my boy, he's wearing #12, well its such a shame, last Tuesday's game he didn't do so well. From the other team, # 9 is his best friend. Well, win, lose or draw I pray that they will be friends in the end. Chorus: So everybody clap for everybody, Everybody cheer for everyone, Everybody clap for everybody, yeah, yeah the game is won. Transitional hook: Everybody clap, everybody, everybody. Everybody clap, everybody, everybody,everybody clap, everybody! 3) Well Winston Word, he votes Democrat, his gal Megan Quin is Republican, she don't go for that. One horrible day, something happened that made the differences seem so small, that love stands up, all for one and one for all! "EVERYTHING GOOD IS YOU" - A heartfelt melodious song of gratitude and testimony sung prayerfully to the Lord, praising him for His love, compassion, strength, mercy, and His ability to empower us in in our journey to become more Christ-like, if we seek, ask, and depend on Him. The music has a melodious Celtic- gospel style feel to it. I enjoyed the lovely intro, with shimmering symbols, flute, violin, and piano. Simple Piano accompanies the vocals with the verses. Chorus: has violin, flute with piano, light drums. Vocals are expressive and touching, well done by Bob Halligan. Lyrical Sample: Everything good in me, is You, everything I should be, is you. All the unbridled glee streaming through, everything good is You. All this hope I have, is You, Where I go when I'm sad, is You. What you say is automatically true, everything good, is You. Everything strong in me is You, All that belongs in me, Is You. Your wisdom that is old, make me knew, Everything good is You. Everything brave in me, is You, Everything saved in me is You, All the love that comes crashing through, everything good is you. Another favorite of this reviewer! I describe it as being another lively, high energy, joyful tune of praise, featuring the full Irish band, and syncopated rhythm, which is all tied together with strong rock beat. Lyrical Sample: Well, I had an idea that I didn't have, until you gave it to me, boy you gave it to me good! I had a lot of love that I didn't have, until you gave it to me, like everybody says you would. And you did, now it's my.... turn to give. Chorus: Watch love go ping pong, You to me, me to You, You to me. It goes ping pong, me to You, You to me, me to You. So sing a song joyfully, from the Ivory Coast to the Zider Zee, we go ping pong, me to You, You to me, me to You. I have a big heart that I didn't have, until you gave it to me, until you showed me how to care. There are so many things that I didn't have, until you gave them to me, until you made me want to share, who I am, I knew I could, now I can! "NO YOU - NO ME" - This title song is another beautiful, stirring ballad, celebrating how much we need God's love in our lives. Music: Blends beautifully with the vocals which carry the tune, with Celtic instrument/ piano background chords, and counter melody. This song tells the story of a young man who leaves his beloved Bridget to go to another land, despite her pleading that "without you there is no me." He discovers the Lord in a bookstore from a clerk that witnesses to him. He discovers his dependence on God's love, mirrors a relationship in his life. Chorus: No You, no me, no water, than there's no sea, without your love I'll cease to be, No You, no me. Chorus: No You, no me, no water, then there's no sea, without your love I'll cease to be, No You, no me. "QUEEN FOR A DAY" - Another favorite song of this reviewer, that really touched my heart. The song reminds us that we need to show God's love to others in need by giving of ourselves and our resources. (1 John 4: 7-8) and (Galations 6:9-10). It also reminds me of the teachings of Jesus found in Matthew 25:34-36. Stirring arrangement of piano, Irish flute, violin, strings, interesting Celtic rhythms; ballad form. Expressive vocals, with some nice harmony. Nice use of dynamics in music and vocals. Starts off with solemn, soft piano chords, setting the somber mood of the song. Chorus has Celtic sounds, interesting rhythms with light snare in the background. Chorus: She's Queen for a day, she holds her head high, her crown is her hope, her robe is her pride, her spirit is strong to dig up this road, she is the Queen for a day. "LIVE LIKE A KING" - A personal faith song, expressing Bob Halligan's heart-felt desire to live like Jesus would, to become more and more like Him. A beautiful song, with strong vocals, nice musical accompaniment of piano, Irish instruments, light rhythm in background. Again, it has nice dynamics, starting soft and building to the finale. 1) My thirst for the things of this earth, isn't quenched by diamonds and pearls. One man lived the life that I want, He's the one they said ruled the world. Though he only wore a crown of thorns, and He never owned a thing. Chorus: I want to live like a King, I want to live like a King, and my decree it will reign, love will rule everything, I want to live like a King. 2) This King did the strangest of things, He befriended the sick and the poor. There was no one too wrong, too right, too black too white for him to love, put up no walls or left unopened doors... There is just such power, healing power is everything that he says, in every deed that he did. "I LOVE YOU" ALWAYS WORKS. - Reaching out in love to others can build walls of support, trust and spiritual connectedness that lasts, creating lives and situations that benefit everyone and please the Lord. Another energetic song to encourage people of faith that has an easy rock beat with a lively Celtic tune, expressive vocals, with nice harmony in parts. Chorus: "I love you," always works, It gets them every time. I love you, is what to do if you want to see them shine. What you do, becomes true so I love you is what I do for thee, me, and mine. SOURCES INCLUDE: ceili rain, and Frank Lewis.